This book explores the linkages between age-related pension expenditures and the fiscal space needed to fund them, as well as to organize the mix of financing methods with different risk-sharing arrangements. 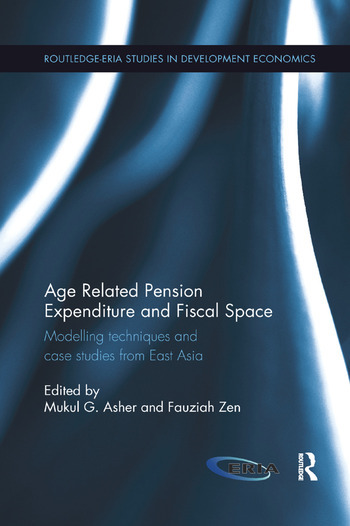 After critically assessing the existing models projecting age-related expenditure in the literature, the book focuses on the case studies of these inter-linkages in four highly-populated East Asian countries, namely China, Indonesia, India, and Japan. Nearly two- fifths of the global population live in these countries. Therefore, how these inter-linkages manifest themselves and the initiatives in these countries for finding fiscal space will have an impact on how the ageing issues are addressed globally. This book does several distinguishing characteristics, including exploration of inter-linkages between age-related expenditure and fiscal space, and application of country-specific methods to explore these linkages, rather than relying standard macroeconomic model. In the process, the studies also bring out the limitations of standardized model used in the literatures. Scholars and policy makers interested in the subject will definitely find the book of valuable use. Mukul G. Asher is a Professorial Fellow at the Lee Kuan Yew School of Public Policy, National University of Singapore. He specializes in social security issues in Asia and in public financial management. Fauziah Zen is an economist at the Economic Research Institute for ASEAN and East Asia (ERIA). She is also an associate professor at the Faculty of Economics, University of Indonesia. She has been working with the governments in ASEAN in the field of fiscal policy, infrastructure issues, disaster risk reduction, and social security. She also serves as an advisor to the Finance Minister of Republic of Indonesia on the fiscal decentralization issue. She obtained her PhD from Hitotsubashi University, Japan.